In order to better understand this influence, people who study the subject tend to divide Biases into types. The problem is that typology presented as a list of unconnected items (and many Bias typologies are exactly like that) has little actual meaning – mere knowing the items doesn’t provide you with any practical advice. The first practical thing I think you should know about Biases to better understand them is where do they come from? So the typology I’ll provide you with at this stage is based on the main factors that lead us to being biased. The first type of bias is Cultural Bias, also called a “cultural stereotype”. Obviously, the agent of Bias here is culture itself. Due to the emphasis of our own culture, we can easily recognize any attempt to establish a hierarchy of value between different genders, religions or ethnic backgrounds as Cultural Bias. When media clearly tends to a certain side of political debate, we also know to label it as biased (and we’re completely right doing it). But what about less conspicuous cases? How do you know to distinguish “winners” from “losers”, “jocks” from “geeks” and “yuppies” from “hippies”? It’s all culture-based. As children, we learn through socialization, accepting certain things as obvious on faith. Some of these childhood beliefs are discarded or modified when we reach adulthood, but some are not. We stop believing in tooth fairies, but we continue to be pretty sure about “proper” behavior of boys and girls. The second type of bias is Cognitive or Thinking Bias, which relates, as its name suggests, to the different distortions in our thinking process. For example, “Halo Effect”, which causes you to ascribe to others traits you know nothing about, based on traits you know something about is a Cognitive Bias. Though this is the most proliferate and the most talked about type of biases, it’s not necessarily the most important one. The reason behind it is that your ability to control what’s inside your head is the smallest, for the simple reason that you’re still required to use your head to do it. Sometimes people find it difficult to distinguish between the Cognitive and the Cultural Biases, because they both exist inside our head, as do all other Bias types. The best way to understand the difference is to imagine someone like Tarzan or Mowgli who grew up without exposure to human culture. They would find it difficult to understand that for some reason people should be stratified by the color of their skin, but they would still think that someone beautiful is also smart and nice due to Halo Effect. The third type of bias is Statistical Bias. It happens due to the simple fact that the laws of Statistics are frequently not intuitive and their objective existence is not necessarily manifests itself in our subjective experience. For example, is it OK to say “on average, people in this field make “x” money”? Yes, as long as you’re using Median and not Statistical Mean to calculate average salary. This is because Mean is too sensitive to extreme values called “Outliers”, and wage curves are known to include many outliers on their right side. Using Mean for variables with extreme values is a classic example of Statistical Bias. As boring as Statistics may sound, it has one very important virtue – YOU CAN LEARN IT! Therefore, despite the fact that Statistical Biases fascinate us much less than Cognitive Biases, they are much easier to work with. The forth type of bias is Emotional Bias. When being influenced by strong emotions, people tend to be less rational than they are in other cases. Of course, the emotion itself could be a result of a Cultural or a Cognitive Bias, but the mistake of judgment would be still caused by emotions. There is a clear difference between not hiring someone of different ethnic background due to a rational though usually mistaken belief that people from this background are less capable (Cultural Bias) to doing the same because of outright contempt towards the members of a specific ethnic group (Emotional Bias). Many people find it difficult to control their emotions, but as Managers are a minority by definition, they are not allowed the luxury of this excuse. The fifth and the last type of bias is Automatic Bias. Due to the limited amount of processor power in our brains, many decisions are made automatically, without the engagement of rational thinking. If other Bias types interfere with the process of rational thinking, this one never reaches the stage. The classic marketing technique of “three Yes’s” (when the actual offer is made after asking the other party three simple questions where “Yes” is the obvious answer) is a clear example of using Automatic Bias to manipulate our behavior. Knowing which decisions are made in this way, can make us much less vulnerable to this kind of manipulation. 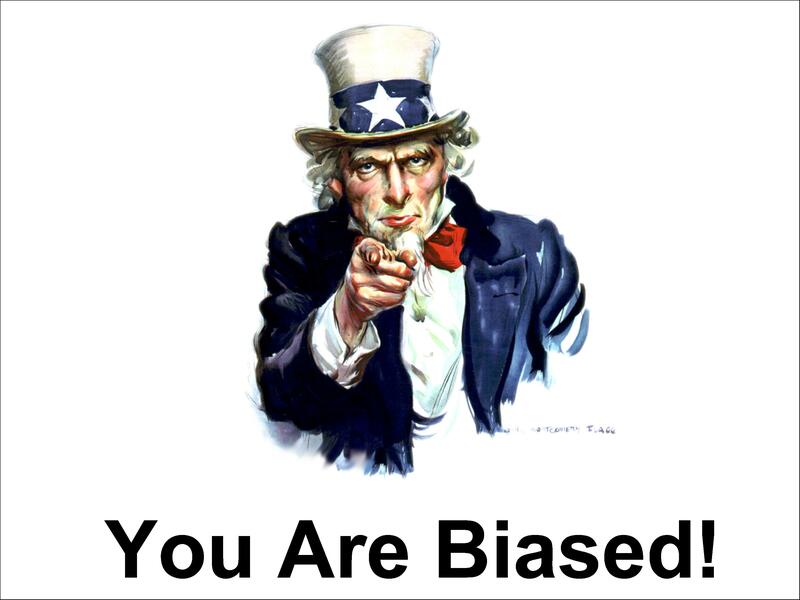 So I hope that now you see my rationale behind the Bias typology – knowing the bias type can tell you where it came from and what are your chances for dealing with it. This entry was posted in Competence Training, Decision Making, Life without biases, Thumb Rules and tagged Decision making, Life without biases, Problem Solving, Thumb Rules by AnyaWorkSmart. Bookmark the permalink.